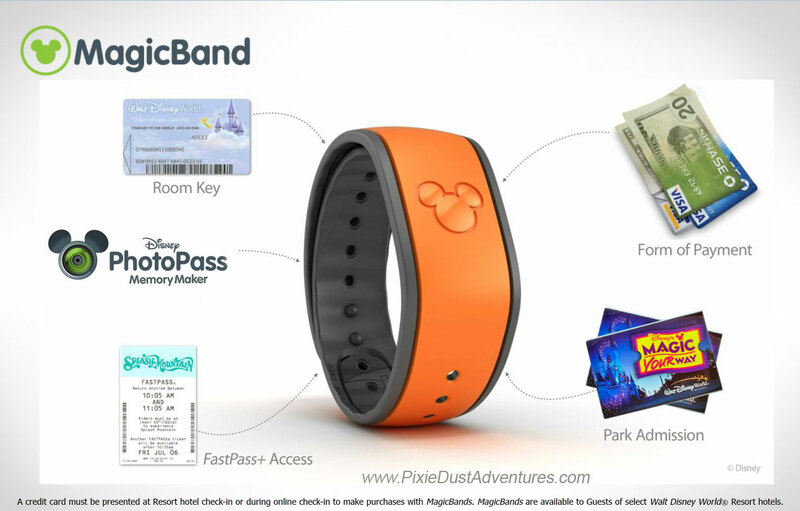 MagicBands are Disney’s ‘all access’ Key To The World. They have replaced the old Key To The World cards given to guests of Disney Resorts. They are your Resort room key, credit card, park tickets, Memory Maker, fastpass+, dining plan, and pretty much everything that has to do with your visit to Walt Disney World. You can tap into all the fun with just the swoosh of your wrist. Your MagicBands are included as part of your Walt Disney World vacation package. The Magic Bands are now required to receive certain photos and other digital content. This is due to the new technology that now adds photos and videos automatically to your Memory maker account, from attractions such as the Seven Dwarfs Mine Train. What Color will you choose? Currently offered in Red, Orange, Yellow, Green, Blue, Pink, purple and Gray. You will be able to select your color when you personalize your MagicBands in your My Disney Experience account after you have linked your vacation. You will also be able to choose a short name or number that will print on the inside of each band. If you do not personalize your MagicBands before they ship, you will receive gray bands. If you do not already have a My Disney Experience account, You can create one by going to www.StartYourDisneyExperience.com Be sure that you customize your MagicBands at least 35 days prior to your arrival; they will ship directly to your house before your departure and will include your matching luggage tags as well as your Magical Extras card. After your first Disney vacation, your MagicBands will remain active in your account until you deactivate them. For consecutive Disney vacations, you can choose new MagicBands and bring along your old ones in case you want to change colors to match your outfit. 😉 Will you collect all of the colors? *I have been told that these bands do have a life span. There is a small RFID chip inside that will expire after a certain amount of time, so if you have older bands, you may want to bring your new bands as a back up. If for some reason you do not wish to wear your MagicBand around your wrist, don’t worry. The center is removable from the new MagicBands and you can purchase a MagicBand keeper to put the center/chip portion of the MagicBand in. If you are still not a fan of the idea, you may request a Key Card that will do as most everything that the MagicBand does. *A credit card must be presented at Resort hotel check-in or added during online check-in, in order to use your MagicBand to make purchases. Thank you for reading, My name is Melissa and I am a Disney fanatic. I’m also a travel agent. You will find me with my family almost every weekend in one of the Disney parks. It never costs extra to book your Disney vacation through me over booking directly with Disney; that’s right, all of my planning services are free. What are you waiting for? Your vacation starts with a free quote.